The term family meal takes on another meaning for 2014 James Beard Foundation Rising Chef of the Year semifinalist. Born and raised in Honolulu to Vietnamese parents, Andrew had an American upbringing, but a strong connection to his Vietnamese heritage through his mother's authentic food. A 2001 graduate of St. Louis High School, he attended the Culinary Institute of America in New York, and completed the program in 2006. Andrew decided to return to Hawaii and immediately landed a job at Chef Mavro, under the tutelage of George Mavrothalassitis and Kevin Chong, Soon after Andrew was named Sous Chef. An opportunity to explore a new restaurant concept that was becoming popular on the mainland was given to Andrew in 2011, where he started his now popular pop-up, The Pig & The Lady. It's at the pop-up and the farmers markets that Andrew, along with Mama Le and the rest of the Le clan, cook up what is essentially family meal in the truest sense to those lucky enough to snag a table. The Pig & The Lady farmer's market stand is selling the family's heritage for all to eat, exposing Honolulu diners not just to the family's take on Vietnamese staples like pho and spring rolls but also fragrant chicken salads, vegetarian stews, and French inspired soups. Andrew stepped back from the day-to-day of running The Pig & The Lady and focused on expanding his craft and culinary knowledge. August 2012, Andrew did a six-month stagé in San Francisco at the newly opened Rich Table, which has been nominated for a James Beard Best New Restaurant award. Lovingly known as "Mama Le" to her patrons, Loan Le is considered "the Lady" in The Pig and The Lady moniker. She is the epitome of the mom who would cook amazing homegrown and delicious meals for her family. Not formally trained, Mama Le developed her amazing Vietnamese and Vietnamese-inspired dishes, through trial and error, from being a professional homemaker. Mama Le's contribution to The Pig & The Lady complements Chef Andrew's formal training and haute cuisine by injecting a sense of "home" and motherly love, which many can argue is what makes her cooking so universally praised. After years of hard work, she is living the dream of sharing her cooking to strangers who soon become "part of the family." Alex Le is all about the family business. Working with his immigrant parents, who started a small retail business selling wares at the Aloha flea market in the early '80s, Alex, along with his older brother Anderson, were there every weekend. The Le's soon swapped the swap meet for a small brick and mortar in Kaimuki, which became the original location for Toys N Joys, a toy and video game mecca for gamers, kids and anime fans for over two decades. Once Alex graduated from high school, he became the general manager and soon, took over the business. After closing the store in 2013, and devoting his entire adult life up to that point for the family business, Alex was set to take a much needed vacation and travel the world. However, opportunity knocked when his brother, Andrew Le, decided to go out on his own and start a pop-up dinner in Kaka'ako. Alex soon immediately fell in love with the food business, especially when it converged with what he loved most growing up in the Le household, his mother's cooking being enjoyed by new diners. He soon saw himself as a purveyor of Mama Le's cooking and found the perfect format for it -- the farmers market. Soon enough, he built a rabid and loyal following. Even though the brick and mortar has been opened for over a year now, the farmers markets are stronger than ever. Alex has organically found a new role in The Pig & the Lady as the head of farmers market and special events for the company and you may see him in a multitude of roles, ranging from serving you some curry at the farmers market, to overseeing a catered event, bussing tables and sweeping floors. Alex loves what he does and sees the immediate reactions of happy faces from satisfied customers. To him, his customers are an extension of his family and FAMILY is EVERYTHING. Working alongside his brother and mom, Mama Le, and he's having a blast. That trip around the world will have to wait a bit longer. Kristene Moon has been working with The Pig & The Lady since our pop-up days at Hank's Haute Dogs. The force behind her passion is lead by her love of the culinary environment and how it constantly pushes her to be better not only as a cook but as a person. "The work is hard and strenuous but the outcome of seeing people enjoying your food that you made from start to finish makes me feel amazing," said Moon. Homemade dumplings, chicken broth from scratch and jook were the norm in Jessica Fu’s household. 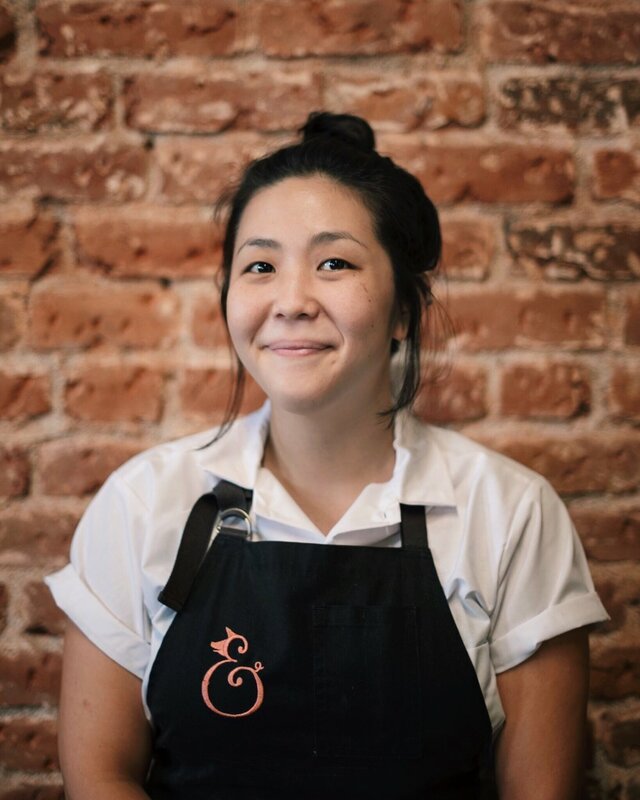 Born and raised in the California Bay Area, Jessica was instilled with a love for food early on. She spent her weekdays, staring at her computer, working a job with a Managerial Economics degree. Her weekends were spent with baking projects and she longed to know more. With a lot of encouragement from her husband and family she decided to pursue her passion in pastry professionally. In 2016, she earned her Professional Pastry Certificate from the San Francisco Cooking School, where she studied under James Beard Award winning Pastry Chef Nicole Plue. After externing at Michelin starred Mourad, she spent a month staging around in some of the best kitchens in San Francisco. It was during this time she found her first restaurant home, the Michelin-starred restaurants State Bird Provisions and The Progress, owned by James Beard Award winning husband and wife duo Chef Stuart Brioza and Chef Nicole Krazinski. Under the tutelage of these two pastry chefs, Chef Mikiko Yui and Chef Kathleen Kwuan she learned to hone her technique and widen her view of what a dessert could be. Since moving to Hawaii she has immersed herself in a world of new ingredients and flavors. Often preferring savory over sweets, Jessica is constantly working to have her desserts be a complimentary unique ending. One can expect seasonally-driven dishes, balanced flavors and textures with a bit of that The Pig and The Lady whimsy.